NCache is an extremely fast in-memory distributed cache. It is much faster than going to the database to read data. NCache provides sub-millisecond response times to its clients. This speed comes from a number of reasons. First, NCache is an in-memory distributed cache and does not have to transform data from rows to objects and it simply return objects quickly. Second, NCache can keep the cache close to the application in the form of Client Cache. 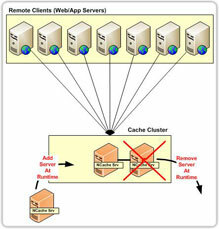 Client Cache can even be InProc to the client application while at the same time synchronizing with the clustered cache. 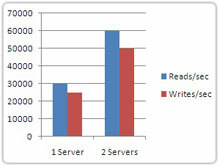 See more details in performance benchmarks. Relational databases are unable to scale out and therefore become a major bottleneck for your application when you try to scale. However, unlike databases, NCache is able to scale out seamlessly and allows you to keep growing your transaction load. With NCache, you no longer have a scalability bottleneck. 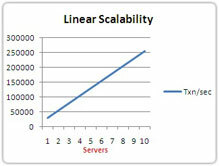 On top of this, NCache provides you linear scalability. Linear scalability means that as you grow your cache servers from 1 to 2 and 2 to 3, your transaction capacity first doubles and then triples from the original capacity. The increase in transaction capacity does not significantly degrade when you grow your cache cluster. NCache has a self-healing dynamic cache cluster that has a peer-to-peer architecture. This allows you to add or remove cache servers at runtime without stopping the cache or your application. The cluster automatically adjusts itself to new situation. All of this is intended to ensure that the cache cluster provides 100% uptime since you're very likely using it in mission critical applications where cost of downtime is very high. Read more at self-healing dynamic clustering. NCache provides a rich set of caching topologies including Mirrored, Replicated, Partitioned, Partition-Replica, and Client Cache. 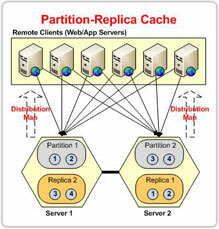 A caching topology is essentially a data storage strategy in the cache. There are multiple caching topologies to handle different situations. Caching topologies are designed to ensure that you scale out the cache linearly (both in terms of storage capacity and transaction load capacity). Caching topologies also ensure that data is replicated either synchronously or asynchronously. Read more details at caching topologies. NCache provides a way for you to replicate the entire distributed cache across WAN without slowing down your cache. This replication is done asynchronously and through a Bridge. You can do either active-passive or active-active replication. The Bridge can either be separate dedicated server or a separate process on your cache server. And, a Bridge can be a two-node active-passive cluster itself to provide fault tolerance. Read more at WAN Replication. NCache provides powerful GUI based and command-line tools for administering and monitor cache clusters. GUI based tools let you easily administer and monitor cache clusters. And, command-line tools let you automate your cache configuration and administration tasks. NCache Manager is a GUI based tool that lets you easily configure, create, and administer cache clusters. And NCache Monitor is a dashboard-style GUI based tool. It lets you easily monitor not only cache clusters but also web/app servers that are its remote client. Read more at admin and monitoring tools.